Kunpeng Airlines, a joint venture of Mesa Air Group and Shenzhen Airlines, has begun regional service in northern China. The venture operates Bombardier CRJ-200s, the same aircraft that Mesa's interisland unit go! operates in Hawaii. The airline now has two of the jets in service, but hopes to expand to 20 by next summer, in time for the Beijing Olympic Games. Above, one of Kunpeng's jets is shown at Mesa's Phoenix home base. The Chinese airline joint venture between Mesa Air Group Inc., parent of interisland carrier go!, and Shenzhen Airlines Co. has started flying in northern China. 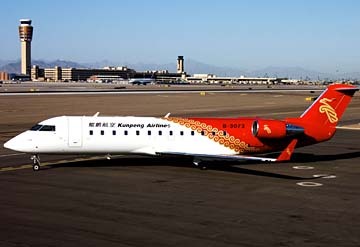 The Phoenix-based aircraft operator partnered with Shenzhen to form Kunpeng Airlines, using a fleet of 50-seat Bombardier CRJ-200s, the same type go! operates in Hawaii. Mesa is the first U.S. airline to operate regional passenger services in China. Service began Friday with two aircraft, which will each fly six flights a day serving Taiyuan, Tianjin, Yichang, Hohot, Nanchang, Hefei and Zengzhou. "It's a country with 1.4 billion people and it has less regional jets than the city of Chicago," said Jonathan Ornstein, chairman and chief executive of Mesa. "It's a remarkable opportunity for us to grow our business with our Chinese partners." The airline expects to have 20 aircraft in service by next summer, in time for the Beijing Olympic Games, Mesa said yesterday. Kunpeng, based in the north-central city of Xian, expects to have more than 100 planes within five years, comprising 50-, 70- and 90-seat regional jet aircraft. The 21st Century Business Herald, a Chinese-language publication, reported in December that Shenzhen will invest $32.6 million for 51 percent of the venture while Mesa will invest $31.3 million for a 49 percent stake. Ornstein said yesterday he could not confirm ownership details. Richard Aboulafia, an analyst for Fairfax, Va.-based aviation consulting firm Teal Group, said he is cautiously optimistic about Mesa's future in China's "fairly closed airline market." "It's an intriguing idea obviously," he said. "Eventually they are going to need to set up regional operations, and it makes sense to do that with an experienced operator. But so much depends on the details -- it's China." Mesa has five 50-seat Bombardier CRJ-200s in Hawaii since June 2006. Overall, it has 185 aircraft with more than 1,100 daily flights to 184 cities. Shenzhen Airlines, headquartered in the southern Chinese business center of Shenzhen, operates 45 A320 and B737 aircraft on 100 routes in mainland China and Southeast Asia.